It is the mission of the Yuma County Sheriff's Office Detention Bureau to provide for the safety and security of people who are arrested, awaiting trial and people sentenced to the custody of the Sheriff. 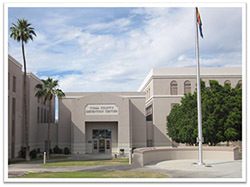 The Yuma County Detention Center is a maximum-security facility designed to receive, process and house inmates who are detained prior to trial, as well as inmates in different phases of the criminal justice system. The Detention Center also houses inmates sentenced by County and City courts. The facility has a rated capacity of 756 inmates. While the number of juveniles in the system was inordinately small compared to the regular population, the impact was disproportionately great. Juvenile offenders require close supervision. They require extra staff to address special management and program issues. Juveniles must be separated from adult inmates by “sight and sound.” They must be provided with the opportunity to attend a school taught within the facility, they must be afforded daily exercise, and their unique nutritional needs must be met.